I bought my first Cast Iron pan a little more than two years ago. I decided to buy it after seeing a cooking video so as to help me cook my Veggie Fajita. Little did I know that its going to be one of my favorite things in my Kitchen. The more I started cooking in it, the more I liked it. I agree that cast iron pans need extra care when compared to nonstick or stainless steel utensils. But these pans are much healthier and I know that if proper care is taken then it can be passed on to generations! I am going to write down the method I follow which I learnt from Lodge Website (#not sponsored). Over the years I also learnt many tricks from the internet and self experience. #I bought a pre seasoned pan. So initially for the first few uses it is going to stick. Be patient. The more you use the better its seasoning gets. #Once you are done using the pan allow it to cool naturally. #Never use soaps for cleaning and they need to be hand washed every single time. 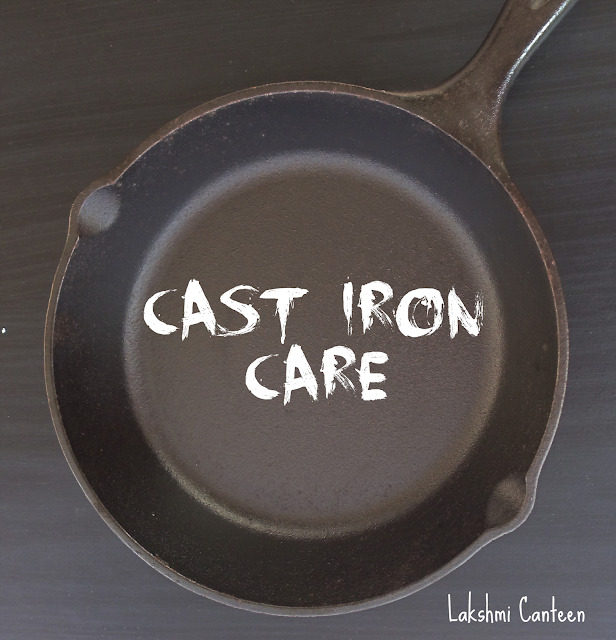 #Water is the greatest enemy of cast iron pans. So never put them in a sink overnight. It can rust pretty quickly. #If a lot of grease and food is stuck after cooking, then use a plastic scraper to scrape the stuck food. Alternatively you can sprinkle salt in the pan. It will absorb the extra grease and will also help to remove the stuck food with the help of a sponge (Salt is abrasive). #Once it is clean, wash it using hot water and then wipe it with a paper towel or kitchen towel. # Now heat the cleaned pan. This will help dry out any moisture left and also helps with improving the seasoning. Once its hot, turn off the heat. Then add 1/2 tsp of neutral oil and spread it all around the surface using a paper towel. Allow it to cool completely and then store in a dry place. #If by any chance if you see any rust spots then sprinkle some baking soda and rub it with a sponge. The baking soda will act as an abrasive and help in removing the rust. #I always serve the food immediately when cooked in Cast Iron pans. The food might react when stored in it for hours. Dosa (Indian Crepe) is one of my favorite breakfast. I make it every week in my cast iron skillet. People believe that nonstick pans are the best pans for making dosas. This is because there is no fear of the dosa getting stuck to the pan and it doesn't require any oil too. I agree to it but over the time the toxic teflon will leach into the dosas making it unhealthy. So I have started using cast iron skillet and if used in a right way you can get perfect crispy dosas every single time. These are the steps I follow every single time. #Add few drops of oil on a paper towel and wipe the surface of the skillet. This will give a very light coating of oil on the skillet. If there is excess oil on the skillet then the batter won't spread as desired. #Heat the skillet on a medium heat only (high heat can burn the dosas and batter don't spread properly on a over heated skillet). #To check if the skillet is hot, sprinkle few drops of water. If it evaporates immediately then the pan is ready for dosas. #Spread the batter. At this point you can add oil on top of the dosa but I never add. #Once the dosa turns crispy, remove from the skillet. Wipe the paper towel on the skillet to get a light oil coating and continue making more dosas. This method gives you perfect crispy dosas every single time with very less oil. If the skillet is new then the dosas might not turn out good the first few times. So use the skillet to make chapathi for first few days. Once the seasoning improves then start using it to make dosas. I hope this post inspires you to buy a Cast Iron skillet. It indeed made my life better.